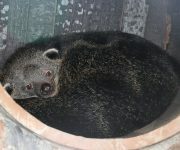 Chicken is a dinner staple in many human and animal diets, including our binturongs Ellie and Elliot, who keepers have discovered prefer their poultry cooked! And to ensure the pair always have their portions to their liking, staff have installed a table top hob in the section kitchen to boil the chicken for two-year-old Elliot and … Continue reading Chicken dinner! 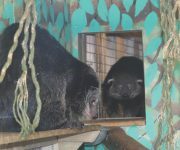 A fire hose hammock is proving to be a huge hit with Ellie the binturong. 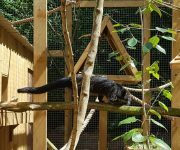 So much so, the one-year-old has hardly ventured off the hanging rubber bed since it was made and installed by keeper Cheyenne Darkins. 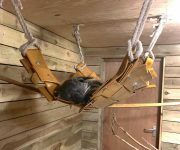 Senior Keeper, Sam Grove, said: “During the colder weather we’ve been keeping Ellie and Elliot indoors and … Continue reading Hammock’s a hit!